Graydon Saunders’ 2015 novel A Succession of Bad Days returns to the world of his earlier book, The March North. It takes place shortly after the events in that novel. training technique is aimed at preventing such misuse of magical powers by detecting potential mages young and steering them into appropriate courses. However … it may not be the only way to shape young wizards. Some of the Commonweal’s magical heavy-hitters have come up with an alternative, and the Commonweal is allowing them to experiment. If the experiment works, the Commonweal will be in much better shape to resist its enemies. If it doesn’t … well, the only thing at stake if Parliament gets it wrong is the fate of freedom on this magic-plagued world. Edgar and his fellow-students-to-be (Cove, Chloris, Zora, and Kynefrid) share a few defining characteristics. Each of them has far more magical potential than the average person. For various reasons, none of them were detected as People of Potential when they were young. (In Edgar’s case, that was because he was infested by an extra-dimensional horror that fed off his Power.) As a consequence of those two characteristics, the five belong to a very special group: people who will almost certainly die young while exploring some fatally flawed application of their gift. Quite possibly they will take many of their neighbors with them. The top wizards of the Commonweal think that they can save these late-blooming wizards. They set up what amounts to a school for gifted youngsters and try to train them to work together, in hopes of transforming them into a self-regulating magical cooperative unlike anything ever seen in the Commonweal. Given that the likely alternative to training is inadvertent transformation into startled-looking scorch marks, the young adults are willing to join the experiment. The nice thing about being a new institution is that Edgar and his fellow students aren’t handicapped by traditional stupidities like class divisions or imposed rivalries between arbitrarily sorted groups of students. The less nice thing is that as pioneers in a new field, the students and their teachers are the ones who will get to discover all the ideas that will later be listed in the Big Book of “Under No Circumstances Do the Following.” It’s not as if what’s being tried is safe; it’s just safer than the alternative. Of course, while failure would be terrible, there’s always the chance that success will be even worse…. Whether Saunders’ world is supposed to be Earth or a world like it, it’s clear that there’s no magical reset button. The world is stuck with the consequences of all the really neat ideas the magic users of the last quarter million years have instantiated. A surprising percentage of those are lifeforms that are aggressively hostile to humans and people like humans. You don’t just want gloves when you pull weeds in this universe: you want a flamethrower. Maybe the occasional Davy Crockett. The overall effect is a world ecology a bit like the one in Nausicaä of the Valley of the Wind. While an awful lot of the book is an exploration of how one might train a group of walking WMDs, towards the end of the novel the plot explores questions of security. If these increasingly powerful kids go off the rails, how can we protect ourselves? It’s a matter of balancing the needs of the community against the needs of the few; it involves asking whether there might be circumstances in which it would be reasonable to ask someone to submit to a death penalty for the greater good. That is, reasonable to the person being asked to submit. Given that the rest of the planet (outside the places where the Commonweal has taken root) is a patchwork of nightmarish dystopias ruled by out-of-control magicians, it reflects well on Parliament that they haven’t just killed our young protagonists out of hand. The fact the Commonweal has a Parliament at all makes this an unusual setting. It’s nice to see a hat-tip to responsible government; I do wish that the story of the Commonweal’s founding didn’t include what seems to be a “then a miracle occurred” moment. One wants to believe that the Commonweal is something more durable than a momentary blip in a long history of mad wizards and atrocities. For those of you familiar with the author’s prose from Usenet and lesser fora, editor Marna Nightingale has done a fine job of dialing back Saunders’ distinctive idiolect. That said, like the late John M. Ford’s fiction, there’s not a lot of narrative redundancy in this work. Read carefully. This isn’t much like other fantasy novels, but it’s not like them in interesting ways. 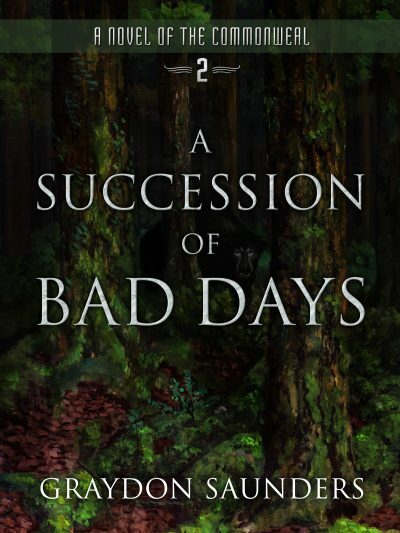 A Succession of Bad Days is definitely worth a look and can be acquired here.